A modern rendering of an era when Hawaiian Culture and music blended and coalesced with American Jazz, a beautiful melding that came to be known as Hawaiian swing. Take a trip back in time to an era when Hawaiian culture and music blended and coelesced with American Jazz – a beautiful melding that came to be known as Hawaiian Swing! Experience a diverse array of music including ki ho'olu (Hawaiian slack key guitar), four horn Hawaiian Jazz combo arrangements and rich brassy 15-piece Big Band orchestrations! 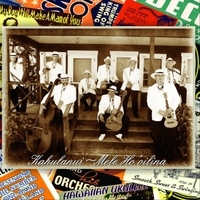 Enjoy the musical legacy that was left behind and that continues to evolve through Kahulanui's lastest album – Mele Ho'oilina – "Musical Legacy"
Kahulanui is a 2013 Grammy Nominee in the Regional Roots Category (for 56th Grammy Award Ceremony) "Hula Kui"
Kahulanui is an inspiration passed down three generations from Grandfather Robert Kahulanui, to Dad Rodgers L.L. Naipo, Sr., to Grandson and Kahulanui band leader, Lena Naipo, Jr. Lena remembers stories of his Grandfather who was a member of the Royal Hawaiian Band during an era when horns and drums were a part of Hawaiian music.Kahulanui (The Big Dance) is an inspiration passed down three generations from Grandfather Robert Kahulanui Naipo, to Dad Rodgers L.L. Naipo Sr., to Grandson and Kahulanui band leader, Lolena Naipo, Jr. Lolena remembers stories of his Grandfather who was a member of the Royal Hawaiian Band during an era when horns and drums were a part of Hawaiian music. “Throughout Hawai‘i in the 1920s and 1930s, one could find orchestras playing Hawaiian Swing and the house would be jumping. Kahulanui borrowed from these influences and performs classic Hawaiian songs in a syncopated style making Hawaiian Swing vibrant and alive in Hawai‘i today. Kahulanui’s execution of big-band stylings evokes an era of smoke-filled bars alive with lindyhopping dancers. Underlying this contemporary take on vintage music, moreover, is a cultural cohesiveness of enacting ku’i–of joining old and new. Like, awesome!